Turkish Pide with Ground Beef always makes a perfect meal! Pide is one of the tasty fast foods in Turkish cuisine. 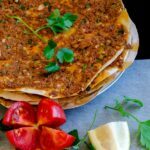 It has lots of varieties and although it’s hard to choose one to put on top of favorite list, Pide with Beef leaves the others behind for us. Not because it tastes better than the rest, but because we love chopped beef more! Yusuf says he likes to feel beef pieces when eating! We made this Turkish with Ground Beef today thanks to two of our close friends. They called us in the morning and asked if we could make pide together. 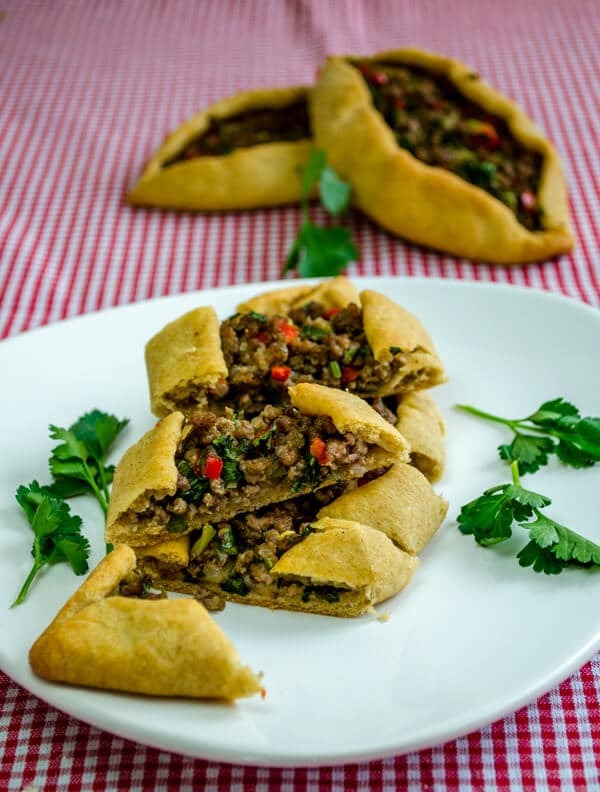 I made pide with beef for them before and they were impressed with its taste. They offered to make it together this time. We immediately accepted their offer without any hesitation as they called at a time when we were trying to decide what to make today for readers of GiveRecipe. They asked me just to make dough until they came and not to prepare anything else. They were so kind to bring the filling ingredients and 2 bottles of ayran, Turkish cold drink made from yogurt, water and salt. I’m aware that I mentioned this drink in several posts, but haven’t share the exact recipe and photo of it. Planning to write a post on it very soon! It was great to work with friends in our kitchen! Everyone has a role in our small kitchen and we enjoyed a lot even when we hit the other’s hand or arm by accident! We made pides smaller than usual Turkish pide this time so that we could place more pides in oven trays at one time. Our friends were so patient and didn’t say a single word when Yusuf and I took shots of Turkish Pide with Ground Beef. You know photography is another process and takes some time. They witnessed all the steps of this process and looked a bit puzzled when we were working on photos. They said that they didn’t know that photography part was that tiresome and needed care. If the dough is too much for you, you can use the half of it and put the other half into refrigerator for a future use. You can make bread or pide again with it in two days. Dust the wooden board with a little flour. Roll it out with your rolling pin. I love that part so much that I can roll lots of dough balls without getting fed up with it! Make it thin and transfer to oven tray. Put the filling on it in oven tray. Otherwise it might be hard to transfer. Fold the edges as you see in the picture. Fold two sides of it in the same way! Isn’t it like making a small boat from paper? 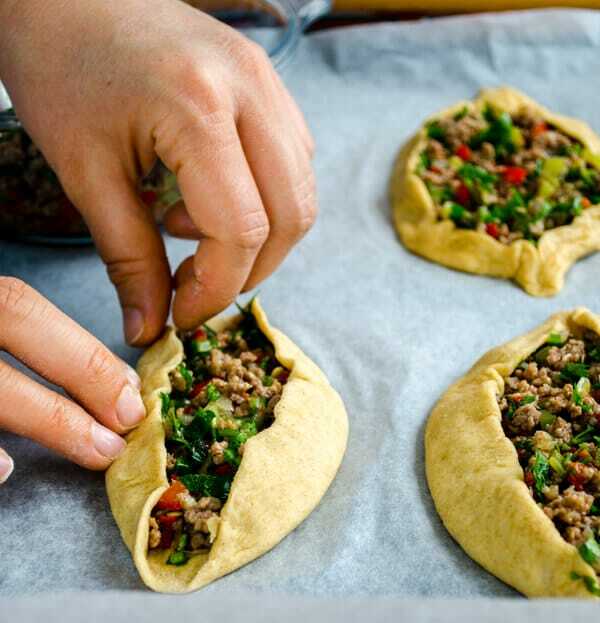 Here is the recipe for Kiymali Pide as it is called in Turkish. Turkish Pide with Ground Beef always makes a hit! Serve it with ayran! Mix flour, instant yeast, sugar and salt. Pour olive oil and add water little by little. Use your hand to combine them well until you have a soft dough. Cover it and wait to rise for an hour. Add ground beef and onion, cover it so that it releases its water. When it starts to absorb its water, add peppers and spices, stir. Cook it for about 10 minutes stirring occasionally. Let it cool.Add chopped parsley when it cools. Dust a little flour on the counter or on a wooden board. Make a log from dough and cut it into 16-18 eaqual balls. Dust the counter again and roll one of the balls out thin giving it an oval shape. Place baking paper in an oven tray and put this oval shaped thin dough on it. Put some filling in it and stick the edges of pide. Repeat the same steps until you finish all balls. Brush each pide with olive oil and bake them at 180C until golden, for about 20 minutes. Note: Do not put the filling on the counter as it might be difficult to transfer it to the oven tray as it’s a thin dough. Hi Tanya, I’ve never tried to freese them, but a reader of Give Recipe tried. You can see it in the comments section above. Hazel says these freeze well. I just had a couple of notes/questions about the recipe. When cooking the meat, at one point you instruct us to add the spices. 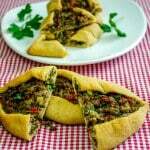 Looking at the recipe, I only saw salt and pepper, and I thought that was strange, so I followed the link you gave us earlier to a similar beef pide recipe, and there I see you added cumin and red pepper flakes. Aha! So I added those to this recipe and the beef was very tasty. Also you say to split the pide dough into 16 to 18 pieces. I am think you meant 6 to 8, right? Otherwise they would be very small. I made 8 and they were just the right size. I am so grateful for this recipe! Thank you so much! My favorite restaurant while I lived in Munich was a Turkish place called Mamas, and I ate this dish along with other Turkish dishes on a regular basis and loved everything. Thanks again! Hi Valerie, great to hear that you loved these pides! And thank you for letting me know the result! I’ve just added cumin and red pepper flakes in the recipe, thanks for reminding. As for the size, I made mine small, you can eat it up with 3-4 bites, that’s why I suggested dividing dough into 16-18 balls. Cheers from Turkey! Thanks for clarifying, Zerrin! I will definitely try making them smaller next time! Thanks for the delicious food! I just made these and they are delicious. As a bonus they freeze well and are perfect for school lunches. Just take one out the night before and put it in the fridge and it is fully defrosted and ready for the microwave the next day. I did make the beef mix a bit spicier because I like it that way. Thank you Hazel for sharing your result here! I haven’t tried freezing them, thanks for the tip! Will the dough recipe work in a bread machine? Hi Lisa! Do you mean the dough recipe can be used for making bread? If so, my reply will go no more than a guess since I haven’t tried it in a bread machine. I think it will work though. Would love to hear the result if you try. Hi Dima, we sometimes stuff it with cheese&parsley mixture too. It is so tasty too! 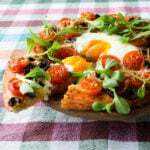 A dish I very much love and make on a regular basis! your pide look mouthwatering. I have seen these before Zerrin and have wanted to make them! They are delicous little boats! I love their unique shape. I bet you had fun making them with your friends. This sounds like a fun meal to make with friends! I’d love to try making these. Hi Lisa! We definitely had a great time together! I love to cook with friends as much as to eat with them! Wowo this looks super super yumm.never had this though and i wish i could grab one. Thank you Finla!It’s so easy to make! You must try it if you have all ingredients! This is so easy and so good and I have all the ingredients here already. This is stuff I regularly buy here in central Texas. Sometimes I can’t get the ingredients for some of the Turkish recipes, but I still like to read about them and imagine them. The quiche was great too ~ I just didn’t have time to write. I am looking forward to the Ayran recipe. That’s something I can make too. By the way, your photography is simply stunning. I thought it was pictures you had bought to put on here! As for pictures on this blog, thank you for your nice words! They are all taken either by me or my husband unless otherwise stated. Thank you Nancy! It’s bigger in shape in restaurants here, but I love this version more. Any kinda pide is welcome in this house 🙂 The filling looks so vibrant! Thank you Ilke! These pides are the result of a good cooperation! It was definitely great to have some friends helping around in the kitchen! Zerrin, these look delicious! I am looking forward to trying them soon. For most of my family I will follow your recipe but my daughter is vegetarian. I am thinking of substituting chopped portabella mushrooms for the beef in her pide. Is there a Turkish pide filling that is vegetarian? Hi Wendy! You can make a filling with cheese and parsley mixture or another filling could be with spinach sauted with finely chopped onion. Planning to share vegetarian pides with these fillings soon! These are just beautiful! They are very similar to the lebanese lahm bel-ajeen, just more colorful! I didn’t know you have pide in Lebanese cuisine! So many common dishes we have! Well, I added green and red peppers as I thought they would give a nice touch on these pides. Restaurant versions may not be that colorful here. That’s why I love homemade foods more, you can increase the amount and variety!